Peanut Butter Mocha Smoothie spiked with caffeine, packed with protein, antioxidants & fiber is a great option or breakfast or snack. 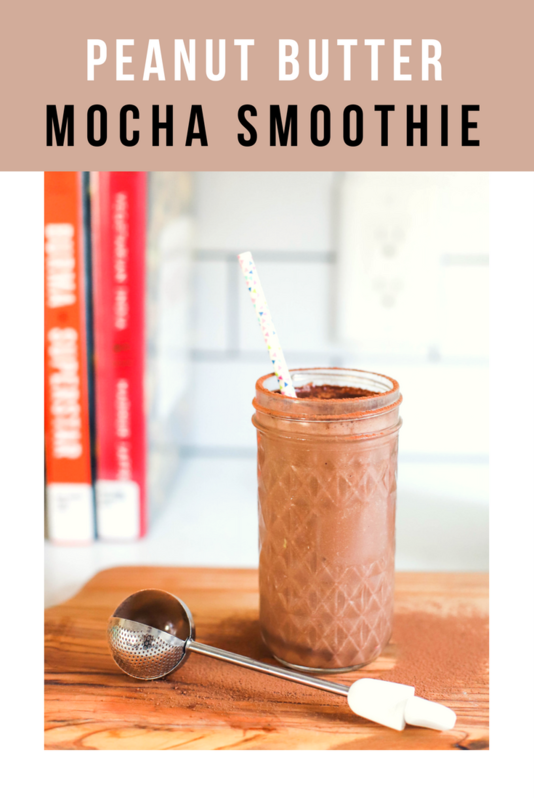 I want to officially wish you a Happy New Year with Peanut Butter Mocha Smoothie…I mean what is not to love about caffeine + chocolate + PB combo right? Ever since I got an espresso machine (which is recent btw), I have been exploring different possibilities with coffee. So far the most exciting creation is ice coffee cubes and I made regular and mocha ones. OMG guys, if you haven’t tried this already, just do it. 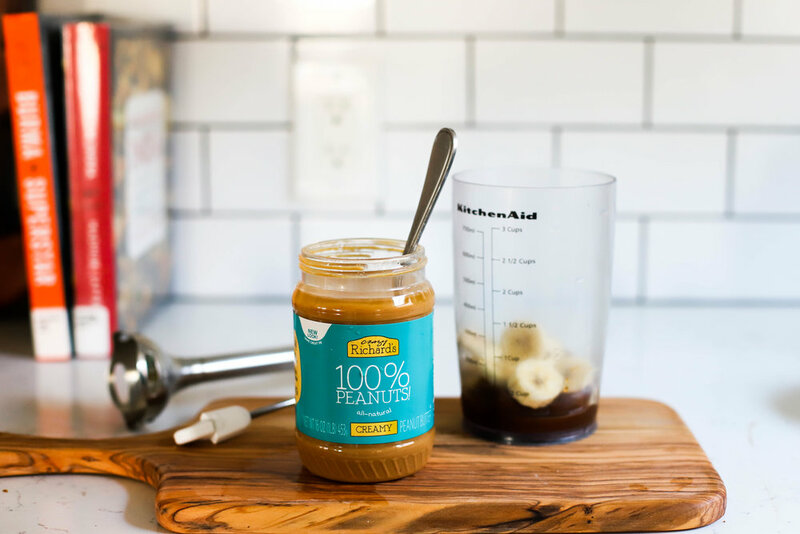 It’s like having iced coffee at your disposal all the time, which you can drink straight up with cream or milk…or turn those cubes into substantial smoothie naturally sweetened and packed with protein, fiber, and other nutrients. I don’t make smoothies too often simply because my immersion blender limits what I can blend (and sometimes it leaves a weird texture) but I when I get on a smoothie train, it’s unstoppable. I am one of those people who needs a substantial, delicious smoothie otherwise, I get hungry immediately. This Peanut Butter Mocha Smoothie is packed with protein from milk (use non-based milk if you’d like) and peanut butter (feel free to sub your fav nut or seed butter), fiber & sweetness from frozen bananas and dates, and a healthy dose of caffeine + antioxidants from espresso and cocoa powder to keep me going until lunch time rolls around. Guide to Making a Smoothie if you are new to the world of smoothies!! Dates are nutrient dense fruit providing nutrients such as potassium, copper, iron, magnesium, and fiber. 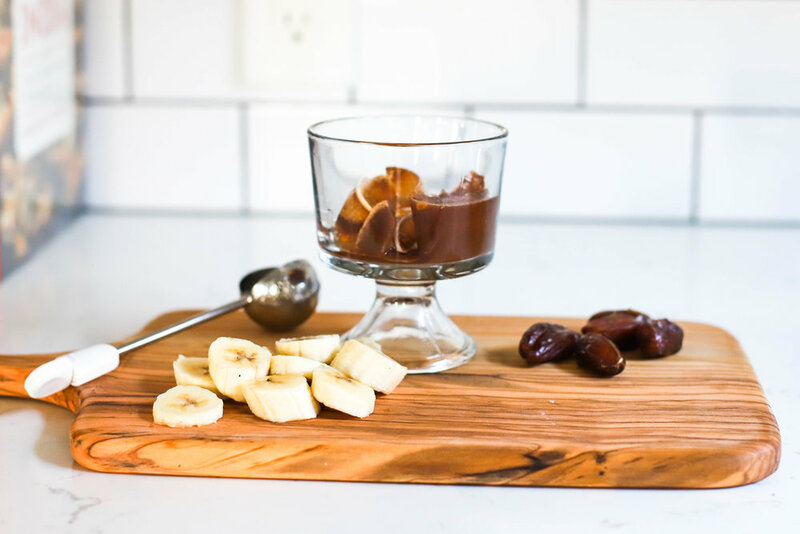 The caramel-like taste from dates adds a nice sweetness naturally to smoothies, energy bites, or make a quick bite-size snack stuffed with cheese or nut butter. The trick to smooth & creamy smoothie is frozen fruit with high content of soluble fiber and pectin (or banana in this case). I have seen frozen cauli and canned white beans being used but I have yet to explore other veggies except occasional greens like baby spinach and kale. I prefer my veggies in the form of a hearty salad. Adding ice to a smoothie also helps with the texture but instead of plain ice, I decided to make ice cubes infused with coffee and cocoa for Peanut Butter Mocha Smoothie. This way you can have your mocha and smoothie together, which totally counts as a wholesome breakfast. I used these capsules for the coffee blend but feel free to use of your choice. To make coffee ice cubes – simply brew coffee according to the instruction and allow it to cool. Pour coffee into ice tray and freeze until solid. For the mocha version, I added 1 heaping tablespoon cooca powder to 1 cup coffee and mixed until well combined and pour into ice tray until frozen. From 1 pod, I was able to get about 8 ice cubes which is enough for 2 smoothies. I hope you will give Peanut Butter Mocha Smoothie a try soon and share your creation using @foodpleasurehealth on instagram. You can also pin Peanut Butter Mocha Smoothie for later. The recipe I am sharing below makes a generous portion for one but feel free to use more or less of the suggested ingredients per your taste. In a blender, add ice cubes, banana slices, peanut butter, dates, milk and blend well. Taste and add more cocoa powder and ice if desired. Optional to add cinnamon and sea salt as it enhances the flavor. Dates and bananas add texture and sweetness to the smoothie. If using only bananas, you may want to add additional sweetener such as honey or maple syrup if you like sweeter smoothies. If you are skipping bananas, add more ice to get that thick creamy texture. You can use caffeine free coffee if caffeine bothers you. If you are not into mocha, may I suggest you Wild Blueberry Ginger Kombucha Smoothie. or, try Banana Dates Tahini Smoothie (which is caffeine free).